Proxima Centauri, the star closest to the Sun, has an Earth-sized planet orbiting it at the right distance for liquid water to exist. The discovery, reported today in Nature, fulfils a longstanding dream of science-fiction writers — a potentially habitable world that is close enough for humans to send their first interstellar spacecraft. “The search for life starts now,” says Guillem Anglada-Escudé, an astronomer at Queen Mary University of London and leader of the team that made the discovery. 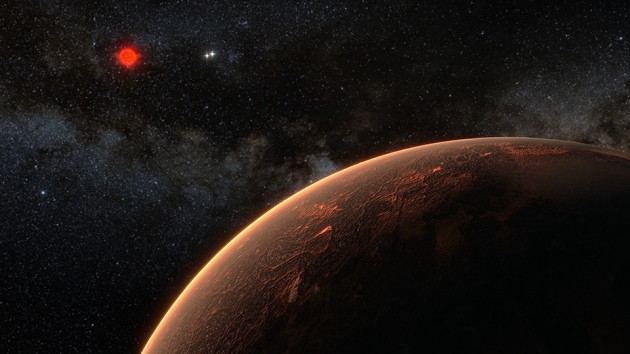 Earlier studies had hinted at the existence of a planet around Proxima. Starting in 2000, a spectrograph at the European Southern Observatory (ESO) in Chile looked for shifts in starlight caused by the gravitational tug of an orbiting planet. The resulting measurements suggested that something was happening to the star every 11.2 days. But astronomers could not rule out whether the signal was caused by an orbiting planet or another type of activity, such as stellar flares. Although the planet orbits at a distance that would permit liquid water, other factors might render it unlivable. It might be tidally locked — meaning that the same hemisphere always faces the star, which scorches one side of the planet while the other remains cool. The active star might occasionally zap the planet with destructive X-ray flares. And it's unclear whether the planet has a protective, life-friendly atmosphere. Astronomers Debate: "How Long Can a Technology-Based Civilization Last?"